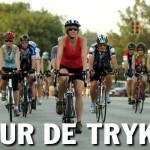 Day two of the Tour of KC was hot and windy. Asphalt temperatures were already in the 90s as the race day began at 11:00 in the morning. Winds were blowing from the south which meant the riders were finishing into the wind. Attrition was the theme of the day; in most cases, riders were just trying to survive in the heat and the wind. The pace at the beginning of most races was hard from the start meaning riders were simply being shelled from the back of the pack as they suffered. Those who could withstand the elements the longest were the ones who were left for the finish. The 50+/60+ were the first ones up. Dean Parker took the win in the 60+ field with Stephen Songer taking the 50+ win. The master’s 40+, junior, and women’s ¾ fields finished out the morning and early afternoon races. Temperatures continued to climb, as did the winds. The women’s field was whittled down to a leading pack of about four riders by the end of the race. There was an attack by, Lindsay Custer, on the final short climb to the finishing straight. She held on until the finish for the win but 2nd place finisher, Esther Lee, came on strong almost taking the win at the line. By the time the category 5 racers took the course, the heat index had risen to 97 degrees and the winds were blowing over 30mph. The group became strung out quickly; riders began falling off the back within the first couple of laps. With 5 laps to go what was left of the field had split to pieces with a group of about 15 left at the front. A smaller chase group was not too far behind them but it was obvious that everyone was suffering from the heat, making any chase that much more difficult. By the time the lead pack saw 3 laps to go there were only 8 riders left in the group. Mark Schloegel ended up with the win with Steve Smithers and Michael Gibson rounding out the podium. The category 4 race had a great turnout with about 50 riders lining up for the start. From the gun, the riders on the front pushed the pace up high and the pack was immediately strung out single file. The fast pace tore the field apart quickly with a group of about 15 riders forming the lead pack. They put almost a full minute into the second chase group after just a handful of laps. With 9 laps to go riders in the lead group began to attack. Matthew Hacket of St. Louis University attacked and gained about 15 seconds on the field. Riders tried to pull him back for several laps, eventually reeling him in. By 6 to go he was brought back into the lead group which was by now, down to eight riders. 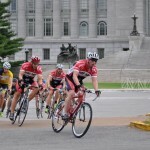 However, after the group made the catch Marcus Farris of US Military Cycling attacked out of the group. Marcus was able to gain an advantage over the group as they were still tired from the previous chase. Meanwhile, the rest of the field had blown apart and riders we racing in groups of 2, 3, or even solo for much of the race. One large chase group was working together over a minute back on the field but there was very little impetus in their efforts. Halfway through the penultimate lap, Gregory Ruark of In-A-Tub attacked what was left of the main chase group to try and catch Marcus who was securing a sizeable lead. Gregory managed to gap the chase group and road away from them for the next 1.5 laps but was unable to chase Marcus down before the finish. Marcus ended up taking solo victory and Gregory won a hard-fought second. John Williams of Team Colavita/Parisi Coffee out-sprinted the rest of the field for third. As was status quo in most of the day’s racing, the category 3 riders went hard from the start. Michael Allison of GP Velotek attacked the group after just a few laps. The rest of the field had trouble working together and allowed Michael to stay of the front as the sorted out who was going to work to bring him back. Their lack of organization allowed Michael to extend his lead to around 30 seconds. Eventually, the group was able to slowly bring him back and he was eventually caught after several long solo laps off the front of the race. The riders established a lead group relatively early. The group stayed together for most of the race but as the lap card counted down closer to the final lap Jesse Siemen attacked the group and built a nice lead. Many riders refused, or were unable to do any work to chase him down and many laps were spent with the chase group gaining no ground. There were several attempts by riders to bridge the gap but none were successful until Kenneth Englert of Bike America Racing attacked the chase group and bridged up to the lead rider as they crossed the line with one lap left to race. 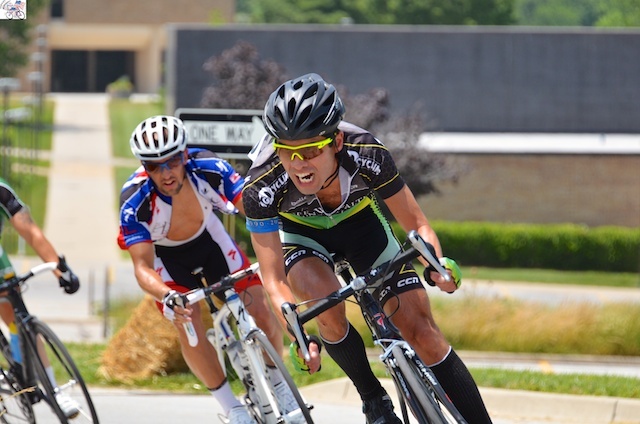 The two riders held off the chase group on the final lap and Kenneth was able to gain a lead of a couple of bike lengths going into the final corner for the win. Jesse crossed the line in second just ahead of the field sprint for 3rd place a few seconds later. As the Pro 1/2 field prepared to race a thick haze, light breeze, and setting sun allowed temperatures to drop to a very comfortable level. The field was about 50 riders strong and boasted some very fast riders. As expected the attacks came almost immediately and the pack was spread out a great distance across the course as they tried to hold onto the wheel in front of them. Tradewind Energy was working to get Brian Jensen the win but Lee Bumgarner also had his eye on a win to add to his recent string of victories across the region. A four man breakaway established itself relatively early in the race with Brian, Lee, Ben Stover, and Josh Estes working together to gap the chase field. Once the break was had established itself the damage had been done and several chase groups had formed. 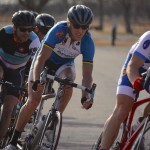 A small chase group behind the leaders consisted of KC locals Shadd Smith and Kent Woerman as well as a few other riders. The lead group worked well together throughout the race. Many riders were pulled from the race as they were lapped by the lead group and the four leaders might have been able to lap the large, second chase group had the race not been shortened due to waning daylight. The final dash to the line saw Lee and Brian sprinting ahead of the other two from their group. Lee just edged out Brian for the win with Ben and Josh taking 3rd and 4th.